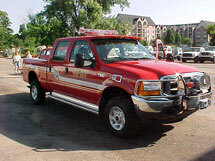 Lake Elmo Fire Department pickup. 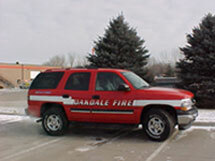 Our business began in 1985 as a division of Road Rescue Inc., a leader in the manufacture of emergency rescue vehicles. In 1999 Emergency Automotive Technologies was formed as a stand alone business under separate and new ownership. Since then our Company has grown substantially in customers and employees. Our team of Electronic Technicians are fully trained and experienced in the up-fitting of a wide range of law enforcement vehicles. Whether it's a squad car, a K-9 unit, special applications unit or even a Command Post Vehicle, we are known as the resource to come to for dependable answers. Our growing base of over 400 customers serves as testimony to our ability to meet your specialization needs. Experienced and reliable information is the trademark our business is built upon. We are well known as the " squad car people" and the ones to call with any type of warning light or emergency vehicle need. © 2004. Emergency Automotive Technologies, Inc. All rights reserved.